question_answer1) Plants give us food grains. What are the examples of such grains? question_answer2) We get gum from the _________ tree. question_answer4) Select the pair that is similar to the one given in ox based on their type. question_answer5) We get oil from all of the following plants except__________. question_answer6) Select the odd one out, based on the edible part. question_answer7) Refer to the given picture of a plant with its few parts labelled. 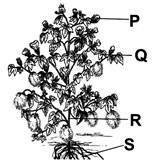 The part______ is essential for the plant because in its absence it cannot produce seed. question_answer8) Which of the following figures correctly shows the movement of water in the plant? question_answer9) Sameer describes a plant that he has seen in a field. Identify the plant. 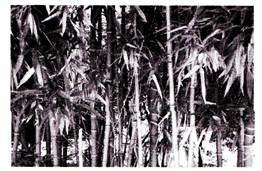 question_answer10) What is the characteristic of the plant whose product is shown below? question_answer11) How is a young plant different from an adult plant? question_answer12) Different plants live for different time periods. Arrange the following plants starting from the plant with shortest life span. question_answer13) What will happen to a plant if we remove all the leaves from it? question_answer14) Select the INCORRECT statement out of the following. 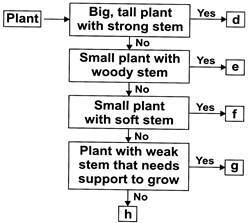 question_answer15) Study the given flow chart and select the option that correctly fills the empty spaces d and e.
What are the similarities between the plants bearing the flowers as shown? (a) They have weak stems. (b) They have woody stems. (d) They grow along the ground. question_answer17) Study the given figure. Which of the following best represents X and Y? question_answer18) Study the given flow chart. Which of the following is correct regarding this? question_answer19) The given figure shows a plant with its parts labelled as P, Q, R and S. Which of the following is correct regarding this? Refer to the given word chop table. Select the boxes that will give answers to the following questions. a. Name of the plant whose fruit is used to get oil. b. Name of the plant part that is eaten in radish.